"My mother gave me this recipe, and told me never to share it, but I think everyone should enjoy it. This dip is definitely better if you make it one day ahead. It can be easily halved, because it makes so much!" If you love simple things, this is for you. I put this dip in a loaf of fresh round bread & then serve it with breads, veggies & chips! This is a very good dip, but I definitely suggest cutting the season salt in half and go from there. It was way too salty. 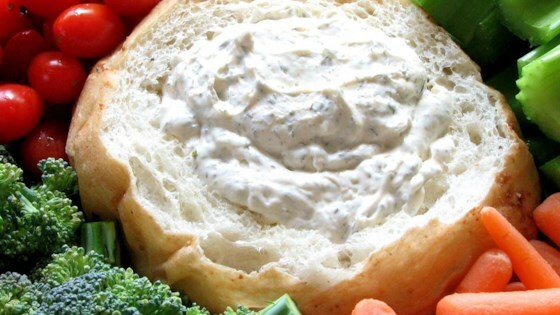 Good, basic and reliable vegetable dip. Nothing weird or exotic here, therefore there's nothing not to like. I backed off on the onion quite a bit and used fresh rather than dried parsley. This dip was SO easy! I really enjoyed how fast it was to make and how few ingredients it required. I'll definitely make this all the time! This is a really good dip. I am so glad you shared it Darby. It made a very large batch but I just halved the recipe.